For cinephiles, Cairo is not necessarily the best of cities. Cinemas only feature Hollywood blockbusters and seasonal Egyptian productions that rarely offer anything authentic. Cairo's independent culture spaces hold one-off screenings and small scale festivals which nevertheless are attended by limited audiences who are usually directly interested in the centre's cultural offerings. This is why Zawya, Cairo's first real attempt at an art house cinema and the brainchild of Misr International Films (MIF), is an important initiative to challenge the status quo. Zawya means a perspective or angle in Arabic, but the word is also used to refer to make-shift mosques on street corners – which fits with the cinema's corner location, and choice of films. "It's a cinema for the films that don't make it to the cinema," reads Zawya's tagline, and that's precisely what the Zawya team provides: a wide range of films that are diverse in both geographical location and genre. In its first six months, Zawya hosted theatrical releases along with retrospectives for veteran directors, short films, documentaries, experimental films and classics. 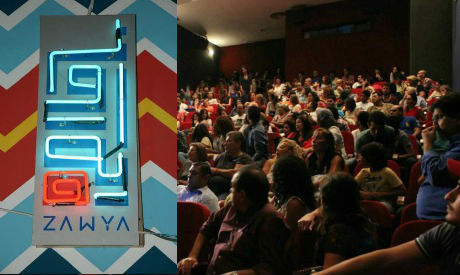 After six months at Odeon Cinema, Zawya's team announced on the last day of a recent retrospective held for late Egyptian iconic filmmaker Youssef Chahine – who also established the company behind Zawya – that they'll be closing for the month of October and re-opening at a new venue, Karim Cinema, which is merely blocks away from their current location in downtown. Zawya's contract for Odeon with the company New Century, which owns both cinemas, was coming to an end, and New Century offered Zawya a chance to move to Karim for a year – after an extensive overhaul and an extended closure. According to the Zawya team, MIF used to have shares in both Karim and Odeon but sold them right before Zawya's opening as the company was not looking to invest in downtown cinemas, which draw fewer audiences than cinemas in newer malls and multiplexes on the city's outskirts. "Our project needs to be in downtown – our crowd is either living in or near downtown or frequents downtown," Youssef Shazli, Zawya's founder and director, tells Ahram Online. "We target different audiences in different geographical areas, but from the start we were all convinced that we needed to start in downtown." Shazli has a point. Cairo's downtown art scene has boomed over the past decade or so. Many people who would be interested in such a cinema will also be likely to spend their day downtown, going to an exhibition or independent play – or, now, a film at Zawya. Zawya is not MIF's first attempt at an art house cinema. In 2008, following the success of the first editions of the Panorama of the European Film– an annual 10-day event hosting film screenings and talks in various cinemas, also organised by MIF – the company took one of the eight screens at the mega-mall City Stars and turned it into an art house cinema dubbed "Cinemania". However, the project closed after only a few months, which Shazli attributes to the cinema's location – a mall in Heliopolis, removed from the city centre. "An art house cinema needs to be accessible, on the street," he says. Zawya hosts three types of happenings: theatrical releases, special events curated by Zawya and special events by external curators. According to Alia Ayman, Zawya's programme curator, the selection of films is not just about tastes – it's also dependent on finances and the availability of films. Sometimes films already have a distributor in the region, which makes the process simpler. Other times, Zawya has to play the role of both distributor and screening hall. "When we want the film to be screened at Zawya, the owner wants to release it in the most amount of cinemas and sell you festival and television rights," Ayman explains. "Zawya is a hybrid project," she adds. Artistically speaking, Zawya aims for diversity – features, documentaries, short films, animation and experimental productions – but also films from an array of geographical locations – the Arab region, Europe, the Far East and Latin America. At the start of the project, Ayman and Shazli selected films haphazardly according to availability and artistic value. However, after some time studying the market, the duo gained insight on what films bring in audiences and which ones are more challenging. Special events like the Youssef Chahine, Abdellatif Cachiche and Mohamed Malas retrospectives, along with the Egyptian short films series and single screenings of classic films, features and documentaries are all sure to attract audiences since they happen only once and are usually followed with a Q&A session. But theatrical releases are trickier since the film stays on for several weeks. "We found that with Egyptian releases we can be more experimental, while foreign films should be more commercial," Shazli says. The films that have had the most success at Zawya have been Amir Ramsis' documentary Jews of Egypt II, Moroccan director Laila Marrakchi's Rock the Casbah (starring Omar Sherif and Nadine Labaki) and Egyptian director Hala Lotfy's Coming Forth By Day. Jim Jarmush's Only Lovers Left Alive and Iranian Oscar winner Asghar Farhadi's The Past also attracted audiences because they are big names in the market. Shazli explains that some films they've screened – like Rock the Casbah – would be considered commercial and not art house abroad. "But alternative is always relative; it is alternative to what is available in the market," he says. Any talk of films in Egypt has to involve one word: censorship. Egypt's censorship authorities are known to cut scenes from films with explicit or sexual content and even ban films from screening commercially. However, Zawya has a special relationship with the censorship authority, which considers Zawya a "festival venue" and therefore grants it more leniency. As a rule they set for themselves, Zawya doesn't screen films that have been cut and prefers not to screen a film at all rather than have it censored. In its first six months, only two films out of 100 were banned – Cannes Palme d'Or winner Blue is the Warmest Colour (for sexual content) and Aida El-Kashef's short film A Tin Tale (for profanity), the latter of which was due to be screened as part of the Egyptian shorts programme. The night of El-Kashef's screening, Ayman and the director made a statement that they were against film censorship and announced to the audience that while the film wouldn't be shown, an online link would be provided for home viewing. Of the many challenges Zawya has faced in its hybrid model, the cinema's weakest points have been scheduling, information release and marketing. Many Zawya goers told Ahram Online they've had issues with finding information on the latest releases and special events. Zawya's marketing depends on social media and their media partners such as Ahram Online and elcinema.com, in addition to on-site marketing through posters and trailers. This tends to limit the audience to those who are active online. "We haven't figured out the perfect formula to balance this hybrid, but we'll manage eventually," Ayman says. Zawya saw its best success during its last month at Odeon. With a programme boasting Jews of Egypt II (which attracted more than 2,000 people over two weeks, averaging 100 people per day), Rock the Casbah and the Youssef Chahine retrospective (which hosted a full house for six consecutive nights), more and more people found their way to Zawya. According to Shazli and Ayman, Zawya grossed more money in September than Odeon's two other screens, which screened Egyptian commercial films. "I thought our crowd was all cinephiles and if we screened a film that was commercial we would risk our reputation," Shazli says. "But what I found is that our crowd is diverse and each film or event attracts a different crowd – our audience is growing." "We've proven we have something to offer, especially when other cinemas are not doing so well," Shazli continues. "I think us being offered Cinema Karim for one year is a good indicator." However, in spite of the success of the project, Zawya's numbers remain conservative. Their business model is not self-financing as ticket sales go to Odeon Cinema and not Zawya – although they take a small percentage and don't pay to rent the screen. Still, the venture isn't losing money because it's dependent on sponsors. In the future, they hope to have their own cinema and set up a fully-functional distribution company so they can be self-sufficient. Once it re-opens at the end of October in its new location on Emad El-Din Street, Zawya promises to continue offering high quality films and original programming. While the November schedule isn't certain yet, Zawya expects to screen Underground/On the Surface, Salma El-Tarzi's documentary on Shaabi music duo Okka and Ortega, along with Palestinian 2014 Oscar contender Omar, originally planned for this month. They will also host screenings for Medrar's 7th Cairo Video Festival for video art and experimental films, along with the second edition of Cimatheque's Kurassat programme and a series of documentary films on Cairo as a city in collaboration with Cairobserver. November will also be the time of the year for MIF's 7th edition of the Panorama of the European Film, and naturally Zawya will be one of its screens. In spite of challenges and shortcomings, Zawya has so far proven to be one of the few projects in the independent culture scene which attracts a strong following beyond Cairo's cultural crowd. Most of all, it has a massive opportunity for financial sustainability and an actual chance to compete in the commercially saturated film market.